Elliot Coleman has literally written the book on the extending the harvest up ‘ere in da Nort. And I can attest to the simple joy of entering a Hoop House on a sunny January day, stripping down to a tee shirt, basking in the humid 70 degree air rich with the smell of living soils, and stopping to harvest mache, claytonia, and perhaps some spinach. But Hoop Houses can do more than just grow greens – they can build your soils in the off season. A few posts ago I regaled you with my attempts to begin composting in our small Hoop House at our Market Garden. The farm owner was so inspired he cleared out 20′ along the back edge of his large Hoop House / Workshop and we built a serious indoor vermiculture bin that is about 20′ long and hold about 12 yards. 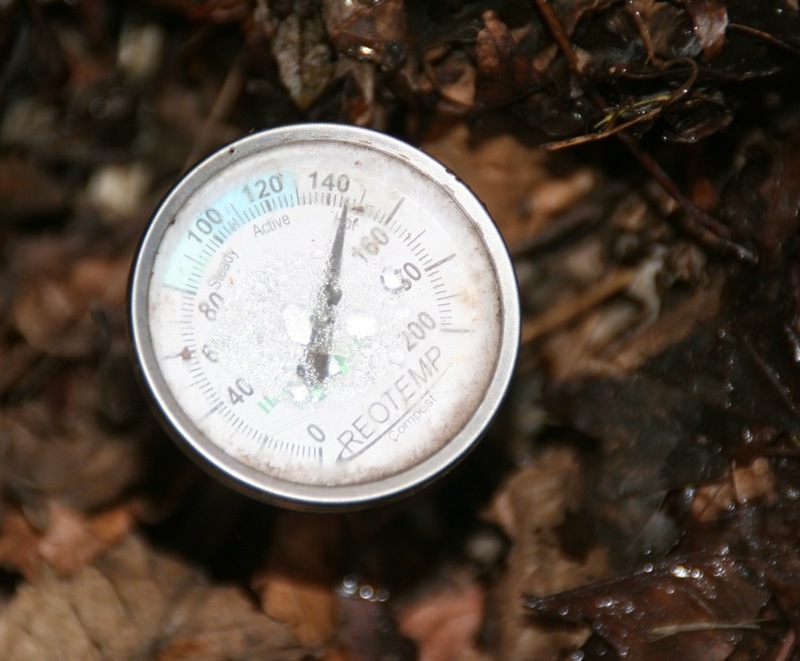 The idea is that in between the center of a thermophyllic “hot” composting pile chugging along at 140 degrees and the air temp of 30-40 degrees there is a layer of the pile that is full of moist organic matter that is sitting at 75 degrees or so. In other words prime habitat for composting worms! Outside air temp was 1 degree with a negative wind chill. Go bacteria GO! Last week he filled the new bin with a mix of horse manure, bedding, and 50 gallons of putrid food scraps he had been saving all year and had never gotten around to throwing on a pile until now. The outside of the hoop house (west facing) was then insulated with a pile of leaves 7′ tall and 12 feet wide at the base, and on top of the manure/gorp mess we piled on another 18″ of leaves to further insulate it and to conserve moisture. Within 2 days this heated up to 145 degrees, and has stayed there for over a week now adding some bTU’s to the workshop. A bin this size could take millions of worms, but given that wigglers are going for $25/lb we decided to call in some favors. 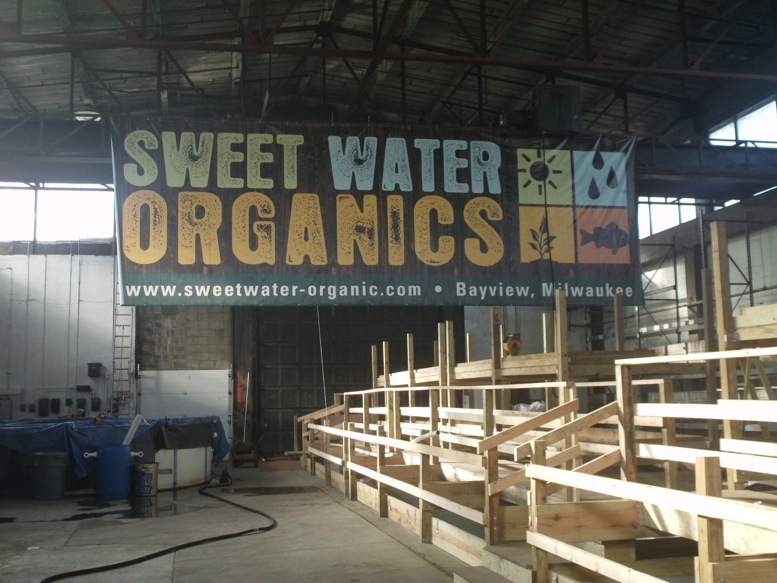 At the Bioneers Conference in Madison last month, one of my fellow panelists was James Godsil, a board member for Growing Power and co-founder of Sweet Water Organics – an uber cool urban ag endeavor in Milwaukee, WI. Godsil is a true Great Soul and we hit it off immediately. I shot him an email and asked if my wife and I could come out for a tour and pick up a few pail of worms and gorp (full of cocoons) which led us to yesterday’s trip and our seeing Milwaukee’s Renaissance first hand. Sweet Water is still growing - under the banner are 3 massive aquaponic tanks mid way through construction. Awesomeness. The site was amazing – I have toured Growing Power several times, and it was very interesting to see Will Allen’s concepts scaled up in an attempt to make them more commercially viable. It will be worth watching to see how far they will have to stray from Growing Power’s laissez faire approach to aquaponics and its reliance on natural filtration and in house feedstocks. Banks and investors have a tendency to demand higher returns on investment than Nature readily provides. But, alas, I stray off topic! Over 12' tall, and steaming despite the 4 degree air temp. We dug 10 gallons and thousands of worms -from an outside pile. It shouldn't be possible, but there we are! After the tour Godsil took us out back to his massive compost / vermiculture pile. Despite the cold (wind chills were negative) we clambered up the pile and dug into the steam to find red wigglers happily crunching away on the grocery store waste Godsil uses as feedstock. Amazing! 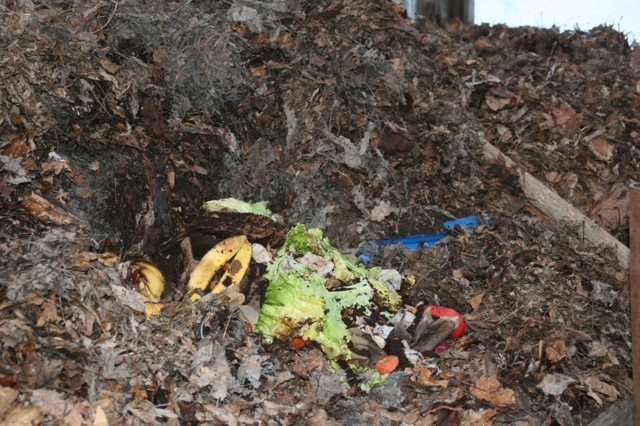 Godsil makes a weekly trip with his pickup to the local store and grabs about 300 gallons of unsaleable vegetables which he then mixes with wood chips dropped off from local tree trimming services – essentially turning 2 streams of “garbage” into highly sought after vermicompost and red wigglers that will have bred up to a population worth thousands by next summer. Brilliant! 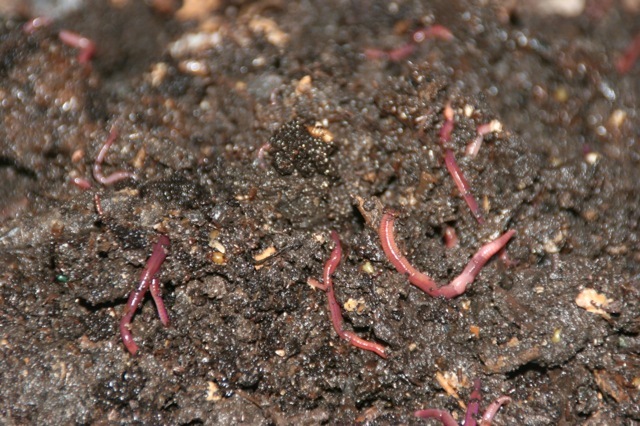 Some of our "City Worms" along with vermicompost full of cocoons. Our hope is to breed enough to start dozens of new worm bins county wide next year. A glob of feedstock for the worms - bananas are a preferred food. Wigglers in prime condition will eat their own weight daily. Witness the steam - the pile was cooking! In the last picture you can just see a bit of blue peaking through. That is a buried 55 gallon drum that is filled with water. The hope is that it will store immense amounts of heat to stabilize the piles temperature for the worms and later in the winter when the pile is cooling, we can then use the water as cooling tanks for our gasifiers – simultaneously heating our worms to make them eat / poop faster and cooling our biomass energy generator to help us power the farm. Awesome! Winter is a time for reflection, planning, and maintenance (mental and physical! 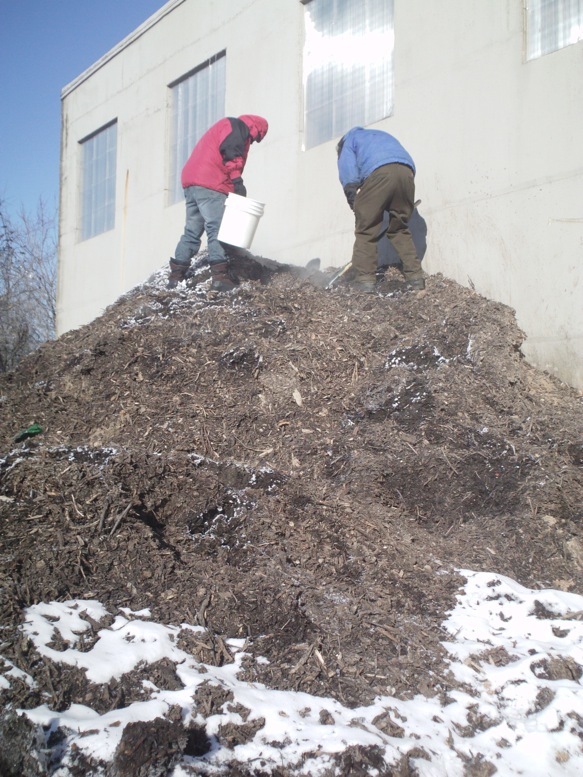 ), but using the Hoop House for composting will ensure our early spring greens are able to get a huge jolt of nutrition with a thousand pounds of worm castings as early as March – with no machinery or energy inputs. Too cool. Great piece, Rob. Can’t wait till I have my own hoop house. Will first need some land on which to build it. Shortly into it I was thinking this sounded a lot like Growing Power. Obviously, you’ve got it covered. Great info. 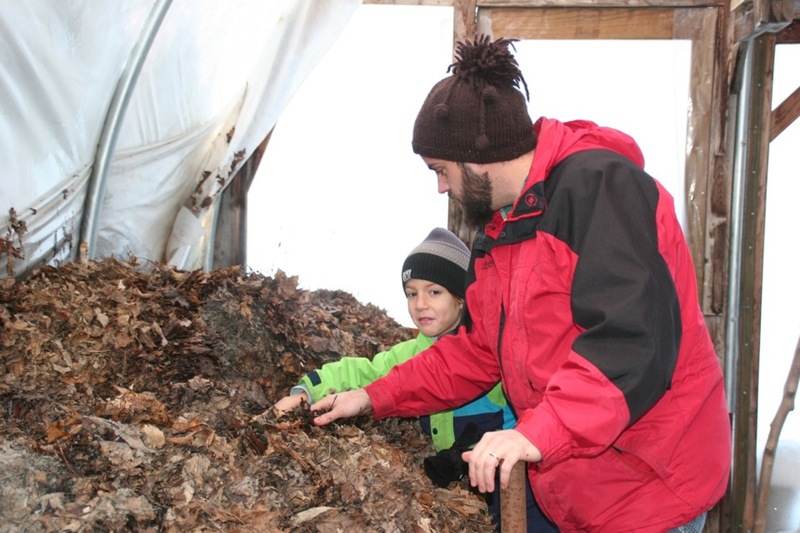 Excellent idea to use the compost pile as a heat exchanger in the winter. And tell your son that gorp is a far more hilarious word than verm.